When I published my Studio Conversation with Jackie Cartwright last week I said that I was going away for a weekend course down at Hospitalfield House on the outskirts of Arbroath. Living in this area we are very lucky to have this facility on our doorstep, it takes me about 20 minutes door to door, but I have been on courses there many times over the years and have always loved the atmosphere. And the food! Last weekend was no exception – Simon the chef fed us very well but special mention must go to his different breads which were just amazing. I was sharing a room with my friend and fellow edge member Jennifer but I think everyone had a great time and produced a lot of ideas that will hopefully be developed in the coming months. It’s always a great opportunity to have time and space to develop ideas in a large studio with like-minded people. If you want to see more about Hospitalfield have a look at this link here. Anyway, I really enjoyed my weekend. 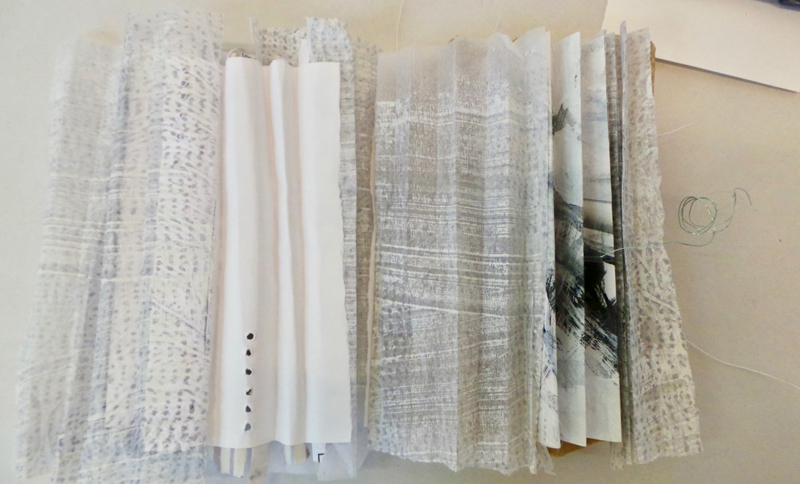 It had been organised by edge – textile artists scotland and although it’s a few years since I have been at Hospitalfield I was looking forward to last weekend particularly because of our tutor, Sally Payne. Sally is one of the most inspiring teachers I have ever known and over the years I have been on many courses with her. She and I shared a few minutes in a very busy weekend and I will be sharing our Conversation soon but this post is about what I produced over the weekend. 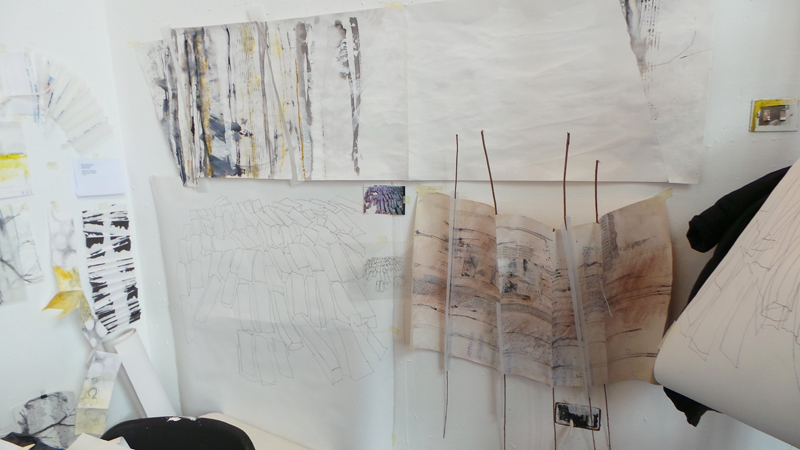 As I have already said, my current project is looking at the Boundary markers of an area in the North West of Scotland so I went with drawings and sketchbooks, photographs, papers in various weights that I had painted or mono-printed, drawing materials; you will know what I would need if you have been on courses. As always, Sally brought lots of different weights of paper, different mark-making tools, wax pot, OHP, etc and over the two days she led us through her process. We started on the Friday evening by working into an A6 sketchbook. Taking inspiration from some source we had brought with us we had to work into the pages of this little sketchbook, developing ideas but keeping contrasts in mind. Over the two days Sally worked us hard. She has always been inspirational in her use of materials, introducing new media and last weekend was no exception. One thing that I liked was an Art Graf marker. It’s shape looks like tailor’s chalk but it is a water soluble graphite and makes amazing marks. I already had a black one but the one I liked using last weekend was an ochre colour. Something else for the shopping list. The expressive marks can be made even more exciting when water is sprayed onto the paper. Great fun. Sally also had another Art Graf product, kneadable putty! It was beautifully soft to draw with and worth looking at although you need gloves to apply it. Sometimes when I go on a course I come away and it is only once I am home that things start to really happen. That can be fine; on those occasions I maybe just need time to allow the ideas to circulate and give myself space to think about what I’ve done. However, last weekend, well maybe it was the atmosphere in the studio and Sally’s teaching, the company, oh and Simon’s bread, but I was pleased with the results of my efforts. I am going to carry on developing the ideas and will show more as time passes. How I leave loved your post about Sheila Payne. Apart from yourself she is the tutor who has really “reached” me and made me realise the potential within me . What you have shown is wonderful and the potential for development of your experiments is vast. You could inspire some of us along these lines when you have time !! That’s very kind of you Dianne. Sally has always inspired me and it was a wonderful opportunity to work with her again in a favourite place. Just the other day I was looking at the work I produced at your workshop at the Distant Stitch summer school and thinking how inspiring it was. I like your idea of putting your work up on the studio wall rather than putting it in a folder as I did. I think I’m going to clear a space on my wall! Your Distant Stitch Summer School was one of the highlights of my year last year, I really enjoyed it and we all put things away, I have design work in drawers all over the place but it is important for this new body of work that I can see it. Time will tell what comes out of the paper work.